People contact us often about repairing glass. They figure since we make hand blown glass, repairing glass would be a simple thing for us to do. This might be true for certain types of repairs… However, most repairs are rarely simple and straightforward as people assume. Can’t you just melt it back together? Fixing broken glass by melting it back together may seem like a logical thing to do… But believe it or not, heating-up and melting back together glass is incredibly difficult if not impossible. There are too many complicated technical challenges for this type of repair. 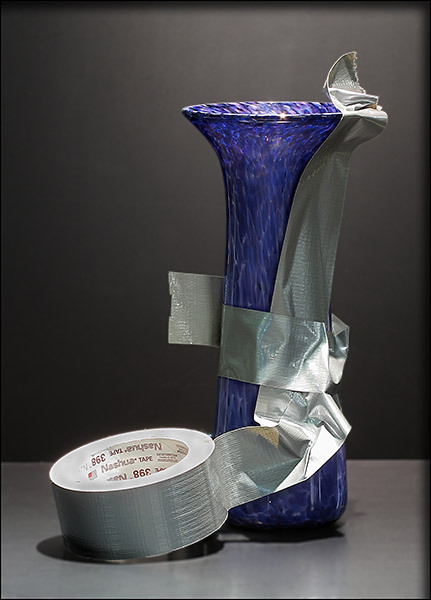 It would probably be easier to make a new glass piece… And this can be an expensive option. Understanding what your broken glass is worth to you is probably the first question that needs to be answered. Is the broken art glass expensive or valuable? Is it a family heirloom or holds significant value to you? Repairs that seem simple can still be expensive when done by a professional. However, if the glass piece is valuable, then a ‘quality’ repair by a ‘specialized’ glass repair professional should be considered. One such company that specializes in repairing glass is Bruening glassworks. However, there are many places that specialize in glass repair for antique glass and hand blown art glass. It is possible to just repair the glass yourself. A simple repair to glass without much value is worth a try… It’s already broken; you’re probably not going to make it worse. There are many places on the web with tips to help you with simple glass repairs. A little planning and using the right tools can work just fine for your needs. This site offers some great tips to make the job a little easier – How to repair china, porcelain, and glass. Your local hardware store will have a variety of glue for different types of glass repair. Loctite is a well known manufacturer of specialty glues and adhesives. Their website has tips and videos helping you to find the right glue for your particular repair. His Glassworks sells professional glass working products, including glues and adhesives. However, keep in mind, the professional products found at His Glassworks require greater know-how and equipment to use… But, it is a well done website and has good tips and videos. We are sorry… Because we don’t specialize in art glass repair, we can’t offer this service. We do hope the above tips and links will help you with your glass repair project.